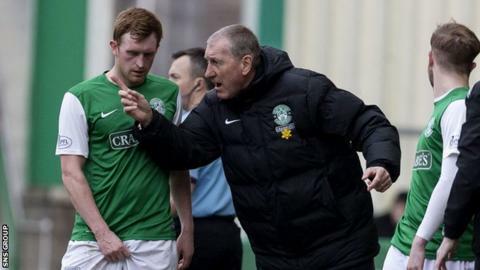 Sunday's derby loss to Hearts may have been a sixth in a row for Hibernian but Terry Butcher sees signs of a recovery. With three games remaining, the Easter Road side are eighth in the Premiership, just one point above the relegation play-off place. "I've got the shape of a team now," manager Butcher told BBC Scotland. "I've been searching and searching for a blend, for a formation. "I was delighted with the way the boys went out and applied that." Hibs ended a run of four games without a goal as they staged a second-half comeback against their Edinburgh rivals but could not overhaul a headed double from Callum Paterson. Butcher, who has been chopping and changing his side from week-to-week in search of a solution to the club's miserable form, deployed teenager Jason Cummings as a lone striker for 72 minutes, while Kevin Thomson and fit-again Scott Robertson anchored central midfield. "We are itching for the next game to come because the boys really want to play and get this system going," added Butcher ahead of the weekend visit of Partick Thistle. "When you're in our situation, losing game after game, it's not nice. You're not playing well, you're not making chances, you're not scoring. "But I think we saw a different attitude, a different mindset on Sunday. It was a derby match and you have to be that way. The situation demands that you are really up for the game. "Okay, we didn't win the game, we did score a goal and we put pressure on Hearts. I thought we were the better team for long periods. "Yes, there were certain faults in our game, we conceded two goals, of course. But, over the piece, I was delighted with the way we played. We've got to take that forward now. "I did see some light at the end of the tunnel because of the shape and strength of the team. "It may sound contradictory after a defeat but it does give you a lift, something to hold on to. "The fans were there for us in the second half. They saw that the lads put in a tremendous amount of effort and played some good football in the process." A midweek trip to Ross County follows the Partick game and Hibs end the season against Kilmarnock at Easter Road on 10 May. "Our destiny is in our own hands," said Butcher, who replaced Pat Fenlon in November. "We are still in a strong position, with two matches out of three at home." With several players out of contract in the summer, Butcher has already starting planning ahead but needs to make sure the club will still be in the top flight next season, with the team finishing 11th in the Premiership entering a play-off against a Championship side. "We've done some work on that," he replied when asked about possible new recruits. "The situation demands we do work on that. "But we want to make sure we get the points first before we really start to crack on and clinch these signings. "It's imperative that everyone is focused on what we do."